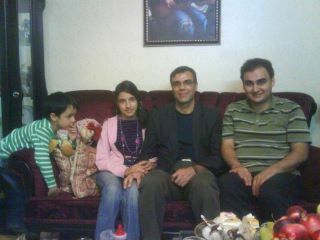 Nasrin Sotoudeh's family, her husband Reza Khandan, her daughter Mehraveh and her four year old son, Nima visited the recently freed Iranian student activist, Peyman Aref today. Peyman Aref is still convalescing from the 74 lashes he received for insulting Mahmoud Ahmadinejad, a punishment he received on top of spending two years in prison for his peaceful protests against the fraudulent presidential election results in June, 2009. The visit by Sotoudeh's family was yet another solidarity gesture by Peyman Aref's well wishers who have been shocked at the barbaric flogging of this 29 year old student activist. As Sotoudeh's family were leaving, Peyman told Nasrin Sotoudeh's four year old son, Nima, "Next time I see you, I hope it will be with your mummy". When Nima replied, "mummy is never coming back", Peyman said he felt himself choking and struggled to hold back his tears until Nima had left and he could pour out his tears at the injustice of a paranoid regime which is hurting so many innocent lives. This morning another student, 22 year old Amin Niayifar, top student in Tehran's Technical University, also received thirty lashes as part of his sentence for insulting Mahmoud Ahmadinejad. Niayifar who was arrested during the Ashura protests had been sentenced by the notorious Judge Pir-Abbassi to six months in prison, 18 months suspended sentence and 30 lashes.